Reality starlet Khloe Kardashian has been dating NBA star Lamar Odom for an entire month -- and the couple is talking about tying the knot! According to E! 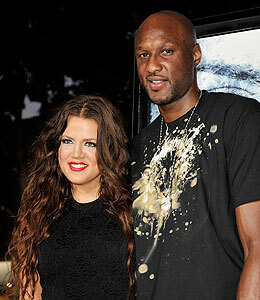 News, Khloe, 25, and Lamar, 29, have been "talking about rings." A wedding would mark a first marriage for both Kardashian and Odom, although the L.A. Lakers forward has two children with ex-girlfriend Liza Morales -- Destiny, 10, and Lamar Jr., 7. A third child, son Jayden, died of SIDS at age 7 mos. in 2005.